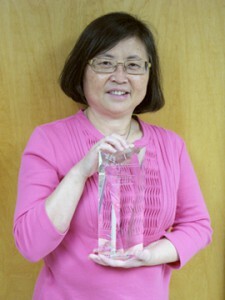 Dr. Mei Baker with her APHL award. Dr. Mei Baker, Wisconsin State Laboratory of Hygiene (WSLH) Newborn Screening Laboratory co-director and University of Wisconsin associate professor of pediatrics, received the Harry Hannon Laboratory Improvement Award in Newborn Screening from the Association of Public Health Laboratories (APHL) earlier this month at the National Newborn Screening and Genetics Symposium. The award is named after Dr. Harry Hannon, the long-time director of the Centers for Disease Control and Prevention’s newborn screening quality assurance program. In giving her the award, APHL noted that Baker’s work has profoundly impacted and improved the current practice of newborn screening locally, regionally, nationally and internationally. Baker, along with researchers from the Children’s Hospital of Wisconsin, led a research project that resulted in Wisconsin becoming the first place in the world to routinely screen newborns for Severe Combined Immunodeficiency (SCID), also known as “bubble boy disease”. That was in 2008, and since then Baker and the WSLH Newborn Screening staff have helped numerous states and foreign countries implement SCID testing. Baker noted that team effort in accepting her award. SCID is just one of the 44 rare, serious inherited disorders included on Wisconsin’s newborn screening panel. These disorders are generally unrecognizable at birth and without treatment can cause severe health problems and even death. Of the nearly 65,000 babies born in Wisconsin each year, 125 to 130 will have their disorder found through newborn screening. Babies in Wisconsin are also screened for hearing loss and critical congenital heart disease in the hospital shortly after birth. In addition to her award, Baker also recently received funding to support two newborn screening related projects. The Legacy of Angels Foundation awarded Drs. Mei Baker and Philip Farrell nearly $590,000 to conduct a “Prospective Study of Newborn Screening for Cystic Fibrosis Using Novel IRT/Next Generation Sequencing Method”. The two-year project will evaluate the usefulness of expanded DNA analyses using a panel of 170 – 200 CFTR disease-causing mutations in newborn screening for cystic fibrosis (CF) in a real-world newborn screening laboratory environment. The hope is to reduce the number of false positive associated with CF screening. The National Institutes of Health/National Institute of Child Health and Human Development awarded Baker and other co-investigators nearly $500,000 to conduct a project “Establishing a Newborn Screening Process for Early Identification and Treatment of Infants with Pompe Disease”. The purpose of the proposed project is to establish and evaluate a process of newborn screening for Pompe disease to facilitate early identification and treatment of infants with Pompe disease. This is the second time the Harry Hannon award has come to Wisconsin. Retired WSLH Newborn Screening Lab Director Gary Hoffman received it in 2008. The comprehensive Wisconsin Newborn Screening Program is administered by the Wisconsin Department of Health Services and the Wisconsin State Laboratory of Hygiene. The program also includes physician consultants, genetic counselors and nutrition professionals from around the state.